Hi. I’m a mom at Gullett Elementary school, of three great kids, and we at the school are getting ready for our Spring Silent Auction and Family Fun Night this April 14th, Saturday from 6-8pm. We are so delighted to have a number of wonderful local vendors (and neighbors!) for our event this year, as well as some exciting local entertainment from The Invincible Czars. We plan to have the auction outside under our lovely new covered courts (weather permitting) with the stars and the spring breezes. There’s really something for everyone and some great prizes to bid on as well from many of our community vendors and shops. The school is at 6310 Treadwell Blvd. I am hopeful some of you will join us, even if your kids are grown, you want to check us out for your future student or you just plain want to support your local school. Please don’t feel intimidated or like you’d be intruding, we are all family at Gullett and we’d love having all our neighbors and friends around for community building and fun! 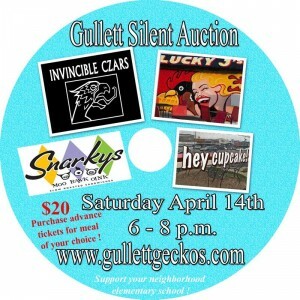 Please buy your tickets in advance to RSVP for food at http://www.gullettgeckos.com/want-to-help/silent-auction/. For your $20 you’ll get a great dinner, dessert, first class entertainment, the chance to bid on some wonderful prizes and plenty of Allandale home-spun fun. It doesn’t get much better than that!